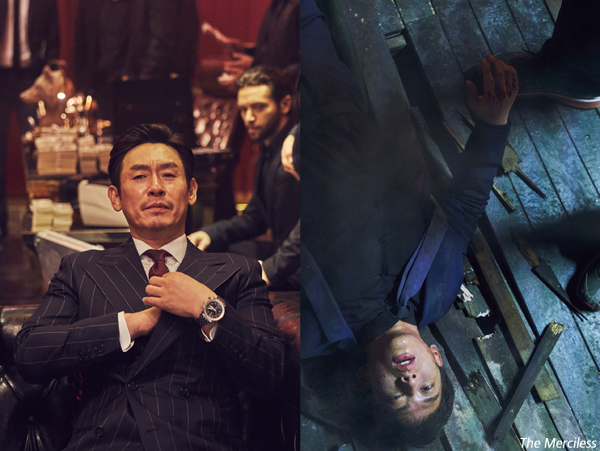 BYUN Sung-hyun’s crime thriller The Merciless, which was screened in the midnight lineup of this year’s Cannes Film Festival, is leading the nominations for the upcoming 38th Blue Dragon Film Awards with nods in nine categories. Close behind with eight nominations apiece are JANG Hun’s Gwangju uprising hit A Taxi Driver, HAN Jae-rim’s prosecutor saga The King and HWANG Dong-hyuk’s period drama The Fortress. Joining the four titles in the Best Picture category is LEE Joon-ik’s Colonial Era trial drama Anarchist from Colony, which has six nods. The Best Director Nominees are almost the same, with the exception of The King which was swapped out for KIM Hyun-suk of the hit drama I Can Speak. The Best Actor category is also closely aligned with Best Picture, and includes SUL Kyung-gu(The Merciless), SONG Kang-ho(A Taxi Driver), ZO In-sung(The King) and both KIM Yun-seok and LEE Byung-hun of The Fortress. Meanwhile there was no overlap with the Best Actress category, which includes nominees KONG Hyo-jin(Missing), NA Moon-hee(I Can Speak), MOON So-ri(The Running Actress), KIM Ok-vin (The Villainess) and YUM Jung-ah(The Mimic). Other films up for multiple awards include RYOO Seung-wan’s big-budget period action epic The Battleship Island, with four nods in mostly technical categories, KANG Yun-sung’s sleeper hit crime debut THE OUTLAWS, also with four, while I Can Speak, JUNG Byung-gil’s The Villainess, LEE Zoo-young’s A Single Rider and CHO Hyunhoon’s Jane all received three nominations a piece. Winners of the 38th Blue Dragon Film Awards will be announced during a ceremony to be held on November 25th at Kyung Hee University’s Grand Peace Palace in Seoul.